Although Dr. Gunther maintains that a clinical application for this murine research is likely years away, he believes the pace will keep up with that of human breast cancer genomics, a field of rapid growth. He envisions that as his team is making progress with rodent models, human breast cancer genome research will run parallel, with synergies emerging between murine and human tumor models. Hopefully, the two models’ discoveries will meet in the future, and accelerate development of treatment strategies. 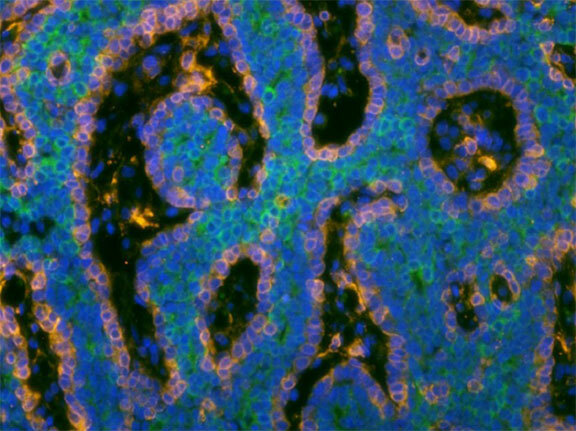 In the short-term, the next step is to establish whether subclone cooperation plays a role in rodent tumors that closely model hormone-dependent breast cancer, the most common human breast cancer subtype. The long-term goal is to discover molecules that mediate subclone cooperation in these pre-clinical models, and then exploit them as drug targets. In Dr. Gunther’s work using mouse tumors, jamming the signals that enable subclone crosstalk causes dramatic tumor remissions. For patients, developing targeted medications that disrupt communication between codependent clones, a strategy yet to be tried in cancer treatment, could lead to a new generation of far less toxic treatments. By contrast, traditional breast cancer treatment strategies that use drugs to poison tumor cells typically carry serious side-effects from the collateral damage to normal, healthy tissue. FELLOWSHIP: Hematology/oncology, Hospital of the University of Pennsylvania, Philadelphia, Pa.
RESIDENCY: Internal medicine, Hospital of the University of Pennsylvania, Philadelphia, Pa.
MEDICAL SCHOOL: Yale University School of Medicine, New Haven, Conn.
Cleary AS, Leonard TL, Gestl SA, and Gunther EJ. Tumor cell heterogeneity maintained by cooperating subclones in Wnt-driven mammary cancers. Nature. 2014 April 3; 508(7494):113-117.